static const char FILE_NETCONFIG  = "C:\\ReactOS\\System32\\drivers\\etc\\netconfig"
Definition at line 41 of file nfs41_daemon.c. Definition at line 168 of file nfs41_daemon.c. Definition at line 289 of file nfs41_daemon.c. 360 eprintf("getdomainname: unable to get a domain name. " 361 "Set this machine's domain name:\n"
Referenced by get_default_domain(), and ServiceStart(). Definition at line 62 of file nfs41_daemon.c. Definition at line 205 of file nfs41_daemon.c. Definition at line 264 of file nfs41_daemon.c. Definition at line 200 of file nfs41_daemon.c. 202 fprintf(stderr, "Usage: nfsd.exe -d <debug_level> --noldap "
Definition at line 380 of file nfs41_daemon.c. 452 /* acquire and store in global memory current dns domain name. 504 // report the status to the service control manager. Referenced by CmdDebugService(), IopLoadServiceModule(), and service_main(). Definition at line 156 of file nfs41_daemon.c. Referenced by ControlHandler(), and service_ctrl(). Definition at line 84 of file nfs41_daemon.c. 89 // buffer used to process upcall, assumed to be fixed size. 133 dprintf(1, "writing downcall: xid=%lld opcode=%s status=%d "
Definition at line 51 of file nfs41_daemon.c. 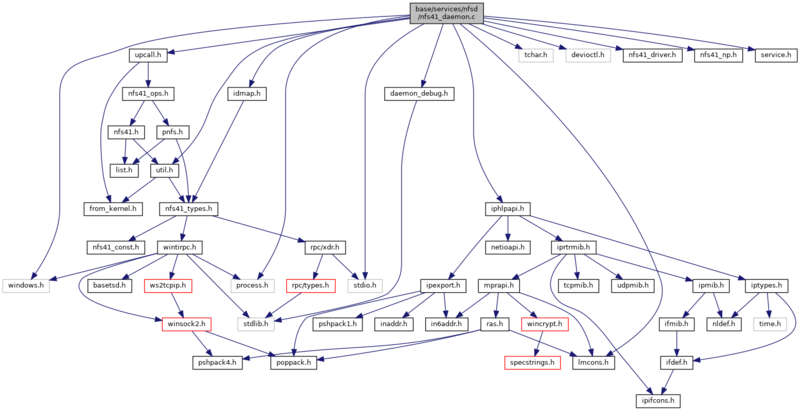 Referenced by map_user_to_ids(), and parse_cmdlineargs(). Definition at line 50 of file nfs41_daemon.c. const char FILE_NETCONFIG = "C:\\ReactOS\\System32\\drivers\\etc\\netconfig"
Definition at line 45 of file nfs41_daemon.c. Definition at line 49 of file nfs41_daemon.c. Referenced by getdomainname(), and handle_setacl(). Definition at line 42 of file nfs41_daemon.c. Referenced by marshall_mount(), ServiceStart(), and upcall_parse(). Definition at line 55 of file nfs41_daemon.c. Referenced by fileTransfer(), local_server_proc(), ServiceStart(), ServiceStop(), and test_delegated_methods().